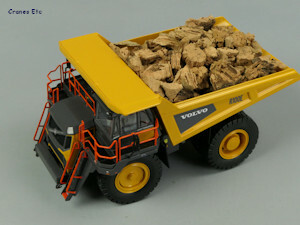 Being loaded by a Volvo EC950E. 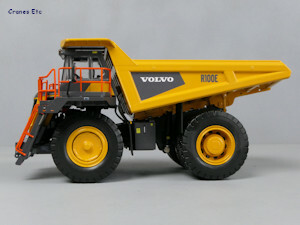 The Volvo R100E Rigid Hauler has a weight of 75 tonnes and can carry a payload of 95 tonnes. 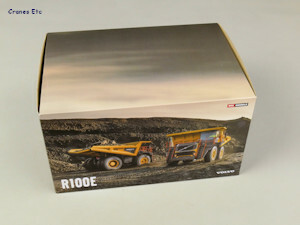 The model comes in a very nice Volvo picture box with the model held within two separate expanded polystyrene trays and protected with clear plastic sheets. 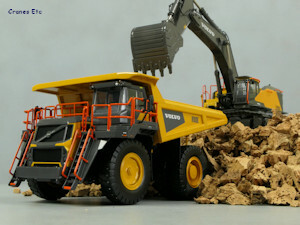 There is no information about the model, but there are some technical details about the real machine printed on the box. 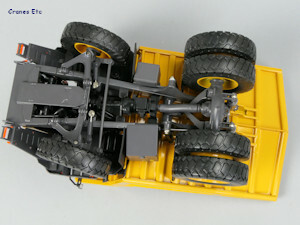 The undercarriage has very good detailing and the engine can just be seen. 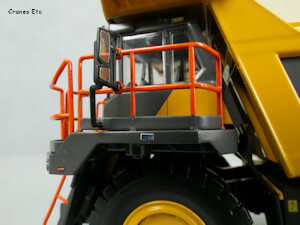 The steering and transmission systems are modelled well, and there is a fuel tank and other equipment. The wheels are very good, particularly the rear ones, and they appear to be metal. The large firm rubber tyres have a good tread pattern. 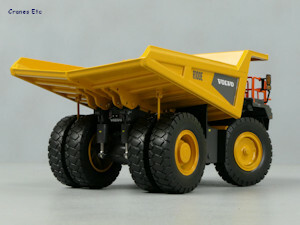 Semi-rigid mud flaps are used. 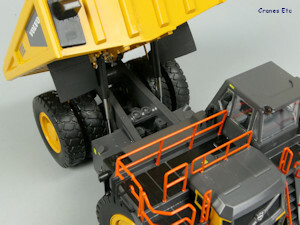 At the front, two access stairs rise to the cab deck and the stairs have a textured surface. Metal handrails are provided throughout although they look a little on the thick side. The front grille has excellent mesh work and a tiny Volvo badge. 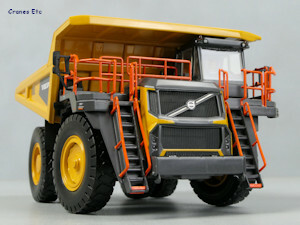 The cab has lights at the front and it is detailed inside, with a fire extinguisher and twin seats with one having the Volvo name on it. The control console is difficult to see but it is finely detailed. There are good quality silvered mirrors outside the cab, but they are not quite at the right angle. 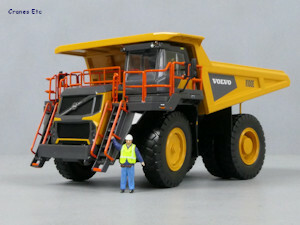 Very small graphics are used at various points on the model. 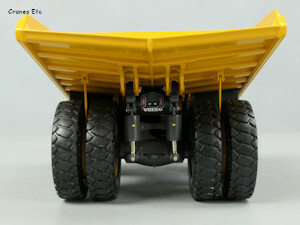 At the back the large suspension cylinders are modelled well, and rock deflector bars hang down between the wheel pairs. The body has a very good structure underneath and is well finished with sharp graphics. Lifting eye locations are solid. The hydraulic rams which lift the body are multi-stage. The wheels roll freely and the steering angle is good. 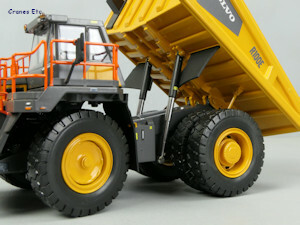 There is excellent sprung suspension on the front and back wheels. The front grille drops forward to reveal the radiator. 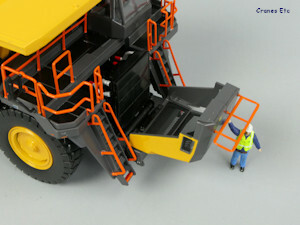 The body tips to achieve a very good angle thanks to the multi-stage hydraulic rams. The body can be locked in the tilted position by inserting two steel pins, although they are difficult to access. 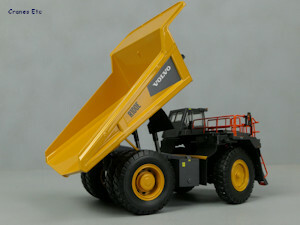 This is a very well made model with a high metal content. It is a large model and this is reflected in the price. WSI has produced a robust and high quality model. It looks great and poses well with other models. 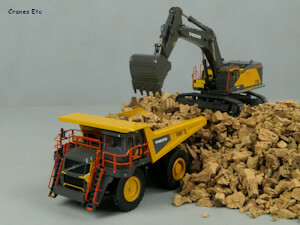 The model first appeared at the Nuremberg Toy Fair in 2019 and the first release occurred at the 2019 Bauma Exhibition. This is a large truck. Body has a nice structure.